Forming as an idea, progressing into a collection of efforts, and ending on the coffee table, Cranial Visions is finally finished. This book is not merely two covers, a binding, and 240 pages; it is a display of thousands of hours of work, in which artists have created a compilation devoted to one of the biggest inspirations in art since the beginning of self expression. The book itself is 8x12, hardback, and features a painting by Shawn Barber on the front cover. That painting is just a taste of all that you will find on the inside. Skulls have been the subject of artistic studies all over the world, connecting artists who otherwise would have nothing in common. The book is divided into chapters based on different artistic mediums; starting with tattoos and followed by paintings, sketches & drawings, mixed media, digital art, graffiti, photography, and ending with “skullptures.” Each chapter is stuffed with images created by masters of their crafts. They play with the colors and composition, and give a different perspective of the subject in every image. Putting this book together was an adventure all its own. We were humbled to receive images from some of our personal favorite artists, while appreciating the discoveries of new up-and-coming artists as well. Tattooing has joined the world of fine art, and this compilation has connected the bridge between all the mediums. Artists like Shawn Barber, Jeff Gogue, Nick Baxter, Bugs, Nikko Hurtado, and Carlos Torres have translated their paintings into tattoos and vice-versa; opening the doors for the possibilities of each medium to grow. There are multi-media pieces by Simon Hayag, Dan Hazelton, and Cam De Leon that introduce us to the potentials of a new age, while keeping the traditional subject matter as something we can identify with. There are drawings from the minds of Alex Grey, Chris Winterson and Andrey Barkov. The sculpture section is a masterpiece all its own. From mosaic-covered skulls by Stan Young and Crystal Thomas, to hand-built machines by Aaron Cain, these three- dimensional pieces demand attention and emotion from the viewer. There is outstanding photography by Jean Baptiste Carhaix, Russell Haig and Julius Motal, presenting the skull in its raw form; as well a portion of the photography section that features shots by Mike DeVries, as he captured skulls from his own collection, providing the reader with inspiration and reference from all angles. All of the pieces in the book are meant for inspiration, and not for simply copying. Every artist has their own perspective, and each are valued for the unique eye they bring to the table. There are over 258 artists who have been included and over 800 pictures of work. It has been a long road and now it's time for you to see for yourself. The book is available for purchase now! Only $69.99. 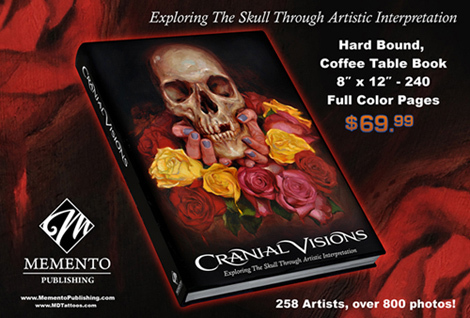 Click Here to order Cranial Visions.